Olaplex is now available here at Essensuals Bath, We are already using it and the results are amazing. 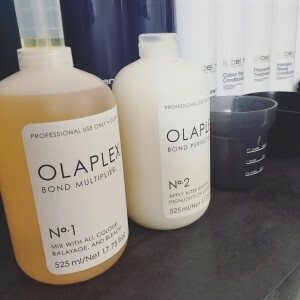 What is Olaplex? Hair bonds are broken during thermal, mechanical and chemical services. Olaplex reconnects broken disulphide sulphur bonds in the hair. The magic works from the inside out to strengthen, condition and literally reconnect the hair strand structure where broken. Olaplex isn’t just for colour damage! Thermal and mechanical damage can also benefit from this service. Olaplex offers permanent protection, so that the hair will keep its strength from the first use. I t’s also free of sulphates, phthalates, silicone, DEA, aldehydes and is not tested on animals. Book your ‪Olaplex service today 01225 465300 OR To find out more info please call and speak to one of our stylists.